When your toner cartridge print starts to become faint, it's not because your cartridge has worn out - it's because you're out of toner. Your cartridge will wear out over time, but cartridges are built well enough to last much longer than their stated yield. The secret to extending their life is to know where to add toner, and to only use toner which is a precise match to the toner which came with your OEM cartridge. Each cartridge is manufactured to work with a specific weight, grain size, and chemical type of toner, and will not work with anything different. Your cartridge has a 'holding tank' which holds the toner powder. Some cartridges already have a hole (Figure 1) which is is filled with a plug. Our refill kits for these cartridges contains illustrated instructions and directions for finding and opening this fill hole. Other cartridges, however, don't have a 'fill hole' so you'll need to make one yourself. Our refill kits for these types of cartridges come with a burn tool which is used to burn (actually melt) a fill hole in the cartridge (Figure 2). Our refill instructions will show you exactly where to make the fill hole (you don't want to make it in the wrong spot). A burn tool come standard in all refill kits for cartridges without factory-made fill holes, and can also be purchased separately on our accessory page. Second, fill the cartridge with the right toner. 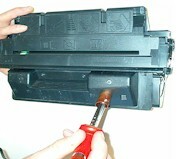 Once you have the hole you use it to 'pour' toner into the cartridge's toner hopper (Figure 3). The toner which comes with our refill kits is manufactured specifically for the cartridge it was ordered for - we don't have 'generic' or 'universal' toner. Your kit comes with a funnel cap which screws on top of the toner bottle and you use this to add toner to the cartridge without any mess. You don't want to shake or squeeze the bottle because this can spray toner powder all over the place. Just press the funnel cap gently against the fill hole and gently tap the side of the toner bottle until the bottle is empty. The last step is to reseal the fill hole. If your cartridge had a pre-made fill hole you simply reinsert the plastic plug that you removed earlier. Refill kits for cartridges where you have to burn a fill hole come with our special aluminum tape, which you use to securely tape over the hole (Figure 4). Gently shake the cartridge to evenly distribute the toner and reinsert into your printer - it's that easy! NOTE - Some newer cartridges have 'smart chips' or fuses which need to be replaced in order for the cartridge to function past its 'expected' life. DON'T WORRY. We stock these chips for those cartridges which require them (Click Here for our complete list of replacement chips), and they are included in the refill kits for those specific cartridges, along with easy instructions for changing the chip or fuser.